Early caries detection has been recognised as the key to optimal prevention and treatment. A range of equipment is used to detect early problems in the mouth. The dental examinations include a thorough risk assessment, this ensures every aspect of dental health is monitored. Diet Counselling – Diet plays a major factor in the condition of the teeth. A Diet Analysis is created for the patient by studying eating patterns and how in turn this can affect the teeth. Advice is given to amend eating habits to benefit the teeth. Saliva Testing – Saliva Testing is carried out annually to determine the pH level, quality and quantity of the saliva. If the saliva is too acidic, it can have a devastating effect on the teeth over time. We determine the reasons behind the acid level using our erosion risk evaluation and take appropriate steps to amend the problem. Occlusal Analysis – this is a standard part of the examination process. We like to assess how the teeth and jaw joints work together. If the teeth do not bite together properly, uneven wear and damage can occur, posing not only a cosmetic dilemma but a functional one as well. Steps can be taken to correct this problem and avoid future ones. Soft Tissue / Oral / Facial Examination – this is a standard part of the examination process. The soft tissue of the oral cavity is examined to check for any changes or concerns. Dr Rogers and his staff also place importance on checking the facial tissue. Patients who have any areas of concern are referred immediately to a specialist. Cases of oral cancer are on the rise, early detection is crucial. Oral cancer is too often discovered in its late stages. 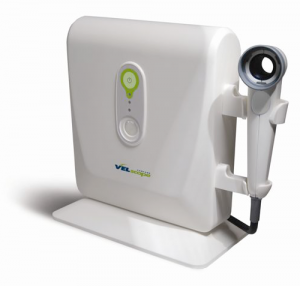 With the Velscope we are able to detect changes in the oral tissue in the very early stages, allowing specialist treatment. The oral cancer check is conducted at every examination.